This photo actually dates to 2007, but it’s too good not to post. 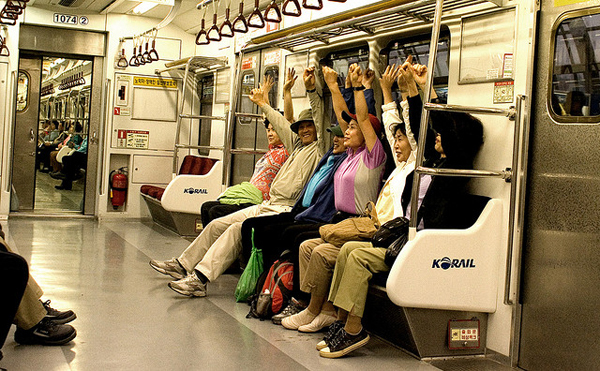 It was taken on a subway in Korea, where a few passengers had decided to work some exercise into their transit experience. Notice how the seats are lined parallel to the windows making the aisle space wider for more standing passengers and making it easier for sitting passengers to get out of their seats. Our light rails should be changed to this configuration; it’s getting more and more crowded as more people take transit, and added bicyclists with their bicycles requires every bit of real estate space in trains.